We are a diverse mix of professional emergency managers and disaster volunteers of varying skill levels with one major thing in common: an enthusiasm for learning how to use social media in disasters, and for developing ways to operate that will make things easier for ourselves and for others in future disasters. We like to share what we learn. Virtual Operations Support (VOS) as applied to emergency management and disaster recovery is an effort to make use of new communication technologies and social media tools so that a team of trusted agents can lend support via the internet to those on-site who may otherwise be overwhelmed by the volume of data generated during a disaster. VOS Teams (VOST) are activated to perform specific functions in support of affected organizations & jurisdictions. Each VOST has a Team Leader that reports directly to the affected organization/jursidiction. As additional VOSTs are established, a VOS Group (VOSG) may be established to coordinate the work of the VOSTs to maintain an effective span of control. The VOSG has a Group Supervisor that reports to the affected organization/jurisdiction. The VOST Leaders report to the Group Supervisor. While many of us already knew each other and/or had worked other disasters together, we were first assembled as a group by Jeff Phillips (@losranchosEM 0r @_JSPhillips) as a team of “trusted agents” in March of 2011. The idea is that in a disaster, anyone trying to monitor and respond using social media will be quickly overwhelmed by the amount of data that needs to be examined and sorted into useful information, as well as the possibility that in a catastrophic disaster, it may be necessary for a predetermined, trusted person or group to search, proritize and forward crisis data from outside of the disaster location if the internet is not functioning or bandwidth is limited, or again, if the on-site personnel are overwhelmed by the amount of crisis data incoming. Our group meets and chats often on twitter and Skype (now Yammer as well), talk about our favorite tools, apps and to coordinate our efforts. Our first “proof of concept” effort (from now on I’ll call them instances, as that seems to be what we’re calling the actual emergency efforts now) was set up in March 2011 by Jeff Phillips to support the “#SMEMCamp” panel at the NEMA Annual Conference. I won’t spend a lot of time discussing this instance, as Jeff did a great explanation of it here. I will say that in my view it was a great success in demonstrating that a group of volunteers well-versed in SMEM can be of great asistance to each other if they coordinate their efforts, and plan in advance to do so. Our next effort was in support of the 140 Conference Northwest, aka #140confNW, which was held in May in Vancouver, Washington. We were led in this instance by Cheryl Bledsoe (@CherylBle) of Clark Regional Emergency Services Agency (@CRESA). Those of us VOST members that were on site worked to live-tweet the conference, communicate problems to the internet audience and conference staff, and help answer questions that were being asked via twitter as best we could. Some of our team were also helping from various locations around the country by monitoring the live stream and live tweet of the event, as well as searching for relative material available on the internet. For example if a conference speaker mentioned a website and one of us on-site tweeted the info without a link, the off-site people helped by looking for the URL and retweeting it, and also tweeted links to other supporting materials. Our third VOST effort was for the social media panels at the National VOAD, or Voluntary Organizations Active in Disaster conference in Kansas City, MO. Once again the team helped to find and share helpful information using twitter and facebook. Short-Term Disaster Recovery expert Bill Driscoll, Jr. of AllHands Volunteers – now at NECHAMA – joined in the effort, video streaming the morning panel session on U-stream using his iPad. The VOST actually had a chance to help relay info as we were under tornado warning and had to go to the hotel basement to shelter-in place between the morning and afternoon social media panels! Some VOAD conference attendees that had expressed uncertainty at the morning session saw us using social media to gather data in the basement, and came back to the afternoon session to learn more and get help setting up an account! The fourth major #VOST instance was Hurricane Irene. While VOST has helped informally on smaller earthquakes, floods, wildfires and misc. smaller disasters, this was the first large instance where we operated as a VOST on a large scale disaster, combining efforts with other individuals and organizations who were assisting on the disaster. We helped to populate maps and lists with contacts and social media accounts for Emergency Managers and disaster authorities in areas that were expected to be affected that were in the projected path of the hurricane. We helped to amplify warnings and vital communications. One of our VOST members was in New York in the path of the Hurricane, and we stayed in contact with her and supported her local social media emergency effort. The sixth VOST instance was in support of the January 2012 northwest floods and severe weather that affected Oregon. (Recovery efforts are ongoing.) In this instance, while we operated and shared crisis data during the flood event, the goal was to support not only response phase efforts, but also to assemble information that would support and streamline both short and long-term recovery phases of the disaster. VOST members located social media and conventional contacts for affected counties, started a map for locating hard hit areas as seen in media accounts, started a Storify media curation/archive, and saved useful info and resources so that Oregon VOAD***** could develop a plan for dealing with a multi-county flood recovery effort. (ongoing at the time of this writing.). This really has turned in to two efforts; one was the initial collection of all data by the VOST – and the subsequent attempt to engage ORVOAD members in the use of this collaborative tool for sharing information amongst themselves. One VOST member (@TheRedElm) even helped me with note-taking during a complex ORVOAD conference call with lots of attendees. We both worked on the notes in a collaborative Google doc. Each of the above VOST instances really needs to have its own unique story told, but I wanted to get this out there before we get too far away from the early efforts to get the discussion started. People on the #SMEM hashtag have been wondering what #VOST is about, so I hope that this provides a little of the background. Applying the VOST concept to a disaster of catastrophic scale, I imagine myself (assuming I survive – I assure you that I do my best to prepare!) getting on site to my county EOC after a major earthquake, and I can only process so much crisis data by myself or with a couple of helpers. But I can contact my trusted agents and ask for help in processing this data. (Some of us are discussing MOUs so that the VOST can self-deploy in case contact is not immediately possible.) Perhaps some people are trapped in their home, unable to make a voice call, but they can get a text message out via twitter, or a text message to someone which a friend then posts to facebook. VOST members can search for these cries for help on twitter, and help to sift that data out and pass it on so that they can be relayed to those who can help. * We follow each other on twitter and gather on twitter; “#SMEM” is the hashtag for Social Media in Emergency Management – we also hold regular twitter chats on the #SMEMchat hashtag at 12:30EST every Friday – all are welcome! ** you will also occasionally see VOSG being used; this stands for “Virtual Operations Support Group” and is used when an “instance” – or operation – becomes big enough to require more people than can be managed; at that point one or more additional VOS Teams will be created, and the Teams will all be part of a VOSG, Or VOS Group, and will be managed following standard ICS guidelines. *** I want to mention that I’ve only been heavily engaged in social media use in disasters for about a year and a half now. That was about the time that I realized (by viewing the Red Cross Crisis Data Summit) how important social media was becoming in all phases of disaster. I’m sure that there are others that need to be acknowledged as innovators and originators in this work, but I’m basing this piece on what I know, so please feel free to fill in the back story in comments. I want to acknowledge both Jeff Phillips, and Heather Blanchard of Crisis Commons as the people that I first heard use the terms Virtual Operations Support” as applied to Emergency Management, and “DOC or digital operations center”. 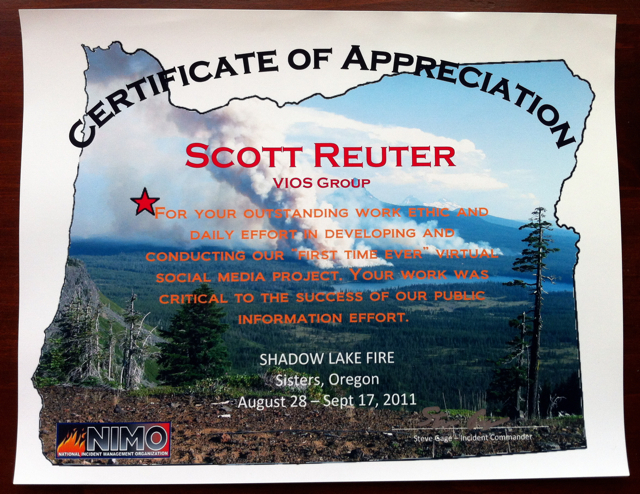 **** a much more thorough academic study will soon be available on the Shadow Lake Fire “VIOS” (virtual information operations support) instance, and I also hope that others including Jeff Phillips, Cheryl Bledsoe and others will share their views on this and other VOST efforts. ***** ORVOAD is Oregon Voluntary Organizations Active in Disaster, a group of faith-based and community service groups who assist those affected by disasters with long-term recovery. On Tuesday I was practicing digital disaster response, helping reformat and retweet critical flood, mudslide and other info to the “Tweak the Tweet” spreadsheet and map (#TtT) during the #NWrain, #WArain and #WAflood events, or “instances” as Data Informatics expert Kate Starbird (@Kate30_CU) calls them. There was a lull in activity, and I was not finding a lot of useful info to put on the map. This is not a bad thing, except that I wanted to keep practicing, because who knows when a bigger emergency will happen, right? Well, guess what. I started seeing reports of a tornado in a place called Aumsville. Turned out to be in Oregon. My state. I ‘m resisting pressing the “delete” key on this post, as it sounds a little self-absorbed, but these are real thoughts emerging from real emergencies, and the surreal feeling is not just because I’m so far from the actual disaster, since I’ve experienced it from both inside the disaster experience, and now outside – not as a passive gawker, but as an active helper. This tornado is no less real to me than the ’94 Northridge quake, my apartment shaking me awake at 5am, flashlight already switched on in my living room**, the smell of natural gas and the flash of downed power lines; no less real than the ’07 Oregon coastal gale, trees stacked on houses, the air thick with roof tiles flying like birds and downtown Astoria’s glass carpet of broken shop windows; no less real than the ’08 Nehalem Valley freeze and power outage, delivering supplies with a sled to folks who burned their furniture to stay warm when the firewood was gone. As a digital volunteer I am not there in person to offer comfort, or help pick up debris, but I do what I can; I start my search of the stream for those key pieces of useful data that could help someone to find shelter, locate a missing loved one, find assistance for an insurmountable task, or direct concerned well-wishers on the internet to a place where they could donate some dollars or valuable time to aid those who had a tougher day than they did. * I contacted Kate after seeing her #TtT presentation at the Red Cross Emergency Social Data Summit. I think that like twitter, which is still discovering what it is, TtT will be an incredibly useful and resilient tool in catastrophic response and recovery. What other real-time, crowdsourced map can be populated with data directly from a disaster area using just a regular cell phone sending text messages to twitter? That’s not the only way to use it, but it’s one that seems to me to be full of possibility. ** I had acquired a vintage ’60’s flashlight a month before the quake. It was sitting on the floor in front of a framed photo that was leaning on my stereo. During the shaking, the picture fell forward, clipping the switch on the light, so when I ran to the living room during the shaking, my flashlight was sitting on in the middle of the floor. True story. I have many interests within the disaster genre. My area of expertise is disaster planning and preparedness, with an extra-strange speciality of earthquake securing of art/objects, but since moving to Astoria, Oregon I’ve gotten involved in all phases of disaster work, and each new phase of the cycle I’ve learned informs the others. I learned about disaster response through CERT and Astoria Fire & Rescue, and learned the hard way the importance of ham radio when all communications fail in a disaster. I then learned long-term recovery the hard way through my work as a disaster caseworker/project manager with my county LTRG (Long-Term Recovery Group), which I helped create. And now Social Media. It’s the Social Media piece that has inspired me to start writing here. It’s great to be involved in the development of something that is truly changing the way disasters are dealt with by everyone. And each part of the disaster cycle will have to learn how social media will affect them, how it can help them, and what tools they will need to use so that they can help their community. I think that I bring a unique perspective to the “Crisis Data” (#crisisdata) or “Social Media in Emergency Management” (#SMEM) discussion. I’ll be posting here on the aforementioned topics, especially as related to Social Media, and I hope that some of this discussion will be of interest, perhaps even be useful to others. Thanks for looking. I look forward to exchanging ideas, and hopefully they will be used to help people.